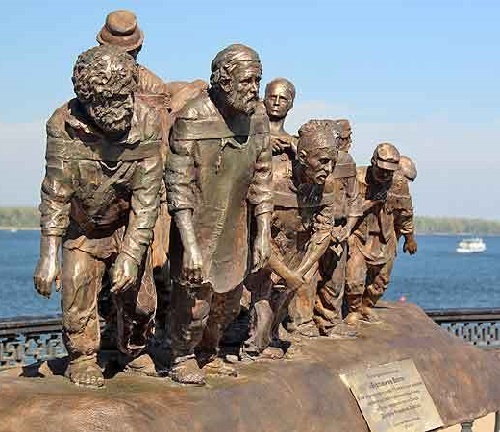 September 11, 2014 – The bronze sculptural composition “Barge Haulers on the Volga” was inaugurated at the Samara embankment to 170-year anniversary of the artist Ilya Repin. The author of the composition became Samara artist Nikolai Kuklev. Sculpture is a visualization of the famous painting: a bronze frame, easel, which depicts boat haulers and, set against the natural landscape of the Volga. The painting has dimensions of 131.5 × 281 cm and is in the Russian Museum in St. Petersburg. The sculpture – about 1.5 m, the pedestal height – about 1 m. In 2014 Russia and, in particular, Samara, celebrated 170 years since the birth of Russian painter Ilya Repin. 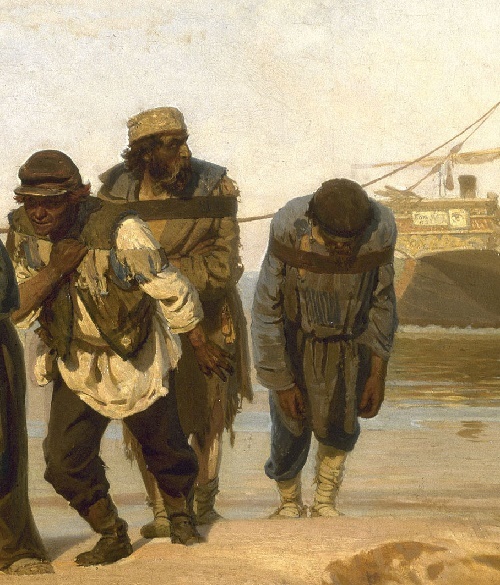 The history of one of the most famous works of the artist “Barge Haulers on the Volga” related to his stay in the village of Samara and Shiryaevo (Samara region). The masterpiece of Russian painting is in a realistic style. 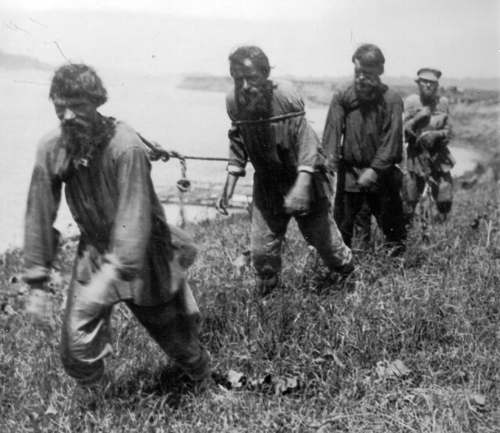 When we look at the picture, it seems that we are on the banks of the Volga, and boatmen are moving straight to us. Barges and other vessels went down the Volga with cargo down the river without difficulty, but back, when against the current, they were drugged by haulers. These people harnessed in straps, pulled the ropes attached to the barge. They walked along the shore, and the barge floated on the water. 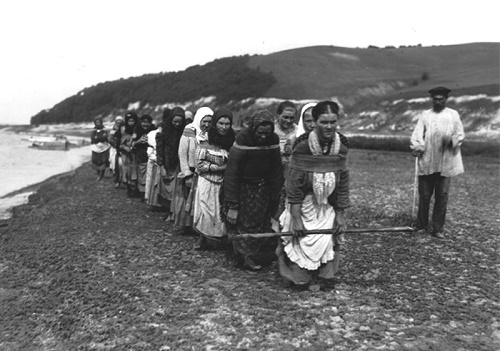 This heavy forced labor did boatmen slaves. But in spite of the difficult working conditions, and rags, the heroes of the picture do not look miserable. They live and work together, and with men’s dignity and fortitude mostly stoical cope with the elements and the free soul. Those workers painted by the artist with great love. All characters, in fact, are real people whom artist met during his trip. He studied in detail their facial expressions. That is why every person in the picture looks so vividly and convincingly. 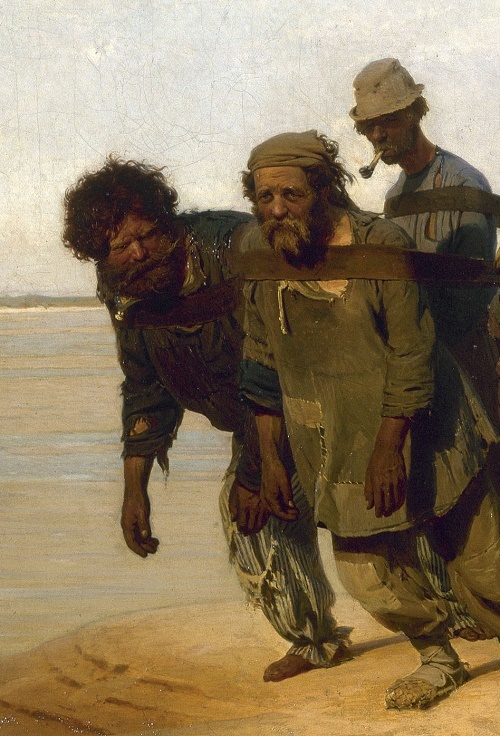 Repin knew life of boatmen. He made several trips to the Volga, and spent a lot of time with a team of boatmen, watching people, getting to know their characters, and making drawings and sketches. Despite the fact that the characters of the painting – real people, together they represent a collective image of the Russian people. The artist was very fond of this his picture. 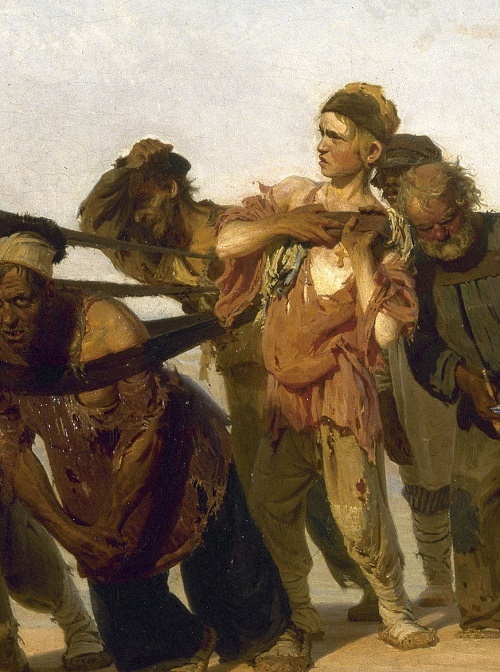 Indeed, the painting drew international praise for its realistic portrayal of the hardships of working men, and launched his career.